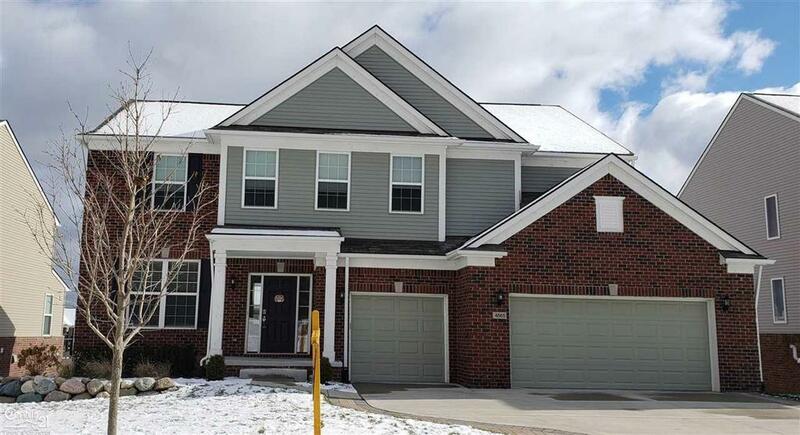 Beautiful, newer build 4 bdrm colonial with W/O bsmt, on large lot in desirable Stonegate West community!Spacious island kitchen W/granite tops,ceramic backsplash & wood flrs, opens to great rm W/tall ceiling & fan.Planning center W/ cabinet space & granite tops,across from breakfast nook, endless possibilities! Lrg pantry in kitchen,all appliances stay!First flr laundry W/cabs,sink & closet.Den across from great rm.Master bdrm with pan ceiling, walk in closet & private bath with double vanity and commode rm. Three additional spacious bdrms up and bonus loft area! All the bthrms have granite counter tops.Lower level walk out plumbed for a full bath. Three car garage!POSSIBLE LEASE TERMS AS OF JANUARY 1ST. $2,800 PER MONTH. IDX provided courtesy of Realcomp II Ltd., via Morgan & Milzow, REALTORS and Mirealsource, Copyright 2019 Realcomp II Ltd. Shareholders. Real Estate listings other than those of Morgan & Milzow, REALTORS are marked with the Broker Reciprocity logo and detailed information about them includes the name of the listing brokers. Information deemed to be reliable but not guaranteed. Any use of search facilities of data on the site, other than by a consumer looking to purchase real estate, is prohibited. Last updated on 2019-04-23.